Almost 100 Victorian students and teachers representing their state on the 2015 Anzac Day Dawn Service Tour will mark the Centenary Anniversary of the Gallipoli landings in a commemorative service at Lone Pine. The Andrews Labor Government’s free whooping cough vaccine for expectant parents and parents of newborns will be available from 1 June this year, a program axed by the previous Liberal Government. Whether your work appears on stage, on screen, in galleries, games or garments, Victorian organisations are invited to get inventive in their marketing with the launch of Creative Victoria’s 2015 Marketing Innovation Fund. The Andrews Labor Government has established a new Ice Help Line as part of a $45.5 million Ice Action Plan to support families and ice users, Minister for Mental Health Martin Foley announced today. Entries for the 2015 WorkSafe Victoria Awards opened today, with businesses and employees that have demonstrated a passion for improving workplace health and safety encouraged to apply. The Andrews Labor Government today announced $200,000 to revitalise the Sunshine Town Centre, creating a strong, safe and accessible hub for pedestrians and cyclists as well as a vibrant and attractive destination for the community. Work has progressed on the Andrews Labor Government’s Melbourne Metro Rail Project. 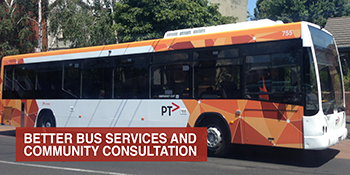 The Andrews Labor Government will not proceed with proposals to radically change metropolitan bus services outlined in recent media reports. Early train, tram and bus services will carry expected record crowds to the Shrine of Remembrance for the Dawn Service to commemorate 100 years since ANZAC forces landed at Gallipoli. Minister for Housing, Disability and Ageing, Martin Foley, today demanded that the Abbott Government improve on its funding offer for homelessness services, which will short-change homeless Victorians out of $1 million per year.